The series of lace designs I've been naming after beloved women in my family (it began with Sahar and continued with Pauline) has a new addition: Giovannina. That was my maternal grandmother's given name, as recorded (to our collective surprise) on her birth and baptismal certificates. She never used it, and neither (so far as any of us recall) did her mother. She was called Jennie, and called herself Jennie, and signed my birthday checks (thank you, Grandma) Jennie. 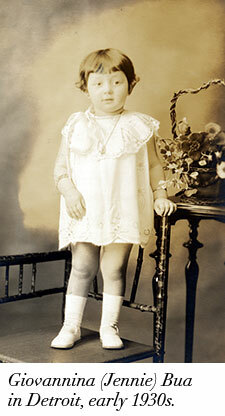 She was born in the early 1930s in Detroit, Michigan, to parents who had immigrated from adjacent Sicilian towns but married (in a match arranged by their families) in the United States. On the day of their wedding my great-grandmother was a few days shy of 16. Giovannina was the third of four children and the first of two daughters. She fell in love with a nice Sicilian boy from New York City and went on to have five children of her own - four daughters and a son. The priceless image below was taken before my arrival in the 1970s, but it's a fair representation of how I remember her. 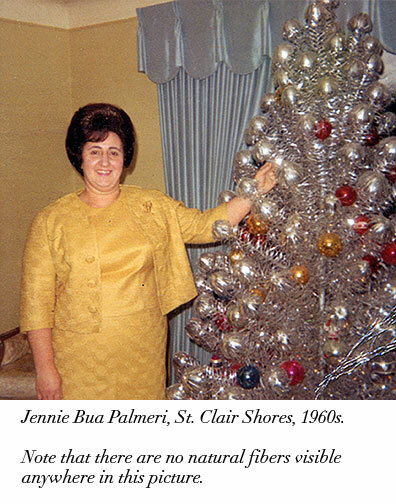 The Christmas tree was in the front room of the house in St. Clair Shores, a suburb of Detroit. In the local patois this space was invariably referred to as the "frontroom"–one word. It was reserved for state occasions: Christmas morning, wedding photos, visits from clergy, official visits from my mother's gentlemen callers–including, eventually, my father. When I think of my grandmother, I think of this room. She decorated it herself, and it was filled with her favorite things. When she wanted new furniture for it, she did the unspeakable for a good Italian wife in that time and place–she went out and got a job to pay for it. The front room was a textbook example of what I affectionately call Dago Baroque. Imagine the crossing of St. Peter's in Rome, but with top-of-the-line seven-layer curtains from J.C. Penney and pale yellow deep-pile shag that never, ever has vacuum marks in it. The gigantic furniture, including the console record player, was French Provincial upholstered in white damask under clear plastic. The wallpaper was gold foil with green flocking. You could see yourself in it. It remained absolutely pristine for decades until the never-to-be-forgotten morning when one of my cousins accidentally smacked it with a wet lollipop. Years later, Grandma still could not refer to this incident without turning red. Bric-à-brac of the most elevated variety covered every horizontal surface. The customary painted miniature pony cart, of course; and a cabinet stuffed with a prized collection of porcelain angels and bells. I now own two of the other major pieces: an 18-inch high Infant of Prague with a metal crown and a full seasonal wardrobe; and a hefty cut-glass candy dish on a marble base guarded by a pair of gilt cherubs. There was one other candy dish - a white marble urn with birds perched on the rim. The former held ribbon candy, the latter green and pink pillow mints. The stuff was so vile that sneaking it when the grown-ups weren't looking wasn't even worth the risk. When my grandmother died in the late 1990s, the candy in the dishes is believed to have been the same that was already installed when my mother was a bride in the late 1960s. There were also, on pedestals, a pair of plaster statuettes of Italian peasants lugging huge baskets of velveteen grapes. My father was parked in an adjacent armchair chair near these on his formal visit, while my mother stirred pasta in the kitchen and presumably begged her parents to go easy on this one. After a while the eligible bachelor got bored and started shooting spitwads into one of the baskets. My mother caught him and happily was able to clear away the evidence before my grandmother could get wise and throw him into the street. I had an epiphany in that room. Not a pleasant one, either. My mother and I drove in for a visit. I was in my mid-twenties, and we were there specially to see my grandfather, who was ill with the condition that would eventually kill him. He had been moved from the bedroom to a hospital bed in the family room (a later addition, off the kitchen). My grandmother, unable to face her wedding bed without her groom...had taken to sleeping on the Sacred White Couch in the front room. While we were there, she ceded that space to me. The plastic furniture covers were gone. There were clothes thrown in a corner near the glass cabinet, and bottles of pills scattered on the coffee table by the candy dish. I was shocked. It was the first time that I realized that certain people and things you thought would always be there, unchanging–Grandpa, Grandma, Grandma's sitting room–are not as eternal as you would wish. It was the moment I first understood, viscerally, that nothing is forever. I can't claim that I consciously intended it, but when I started working with the lovely Filigran (100% merino superwash) that Skacel sent to me with a request for a lace design, these memories of my grandmother manifested in the square motif that became the main element in the stole. It's ornate, but orderly. The construction's a bit unusual, by the way. 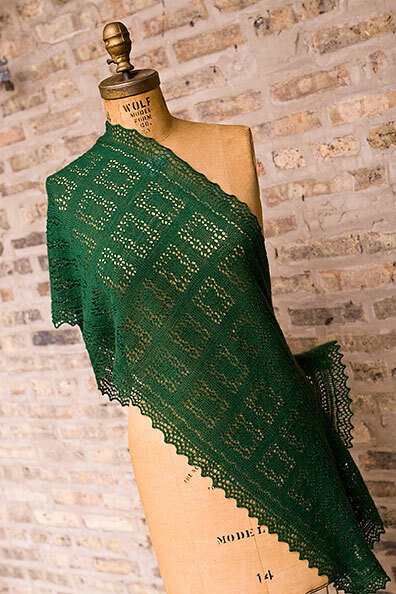 I took inspiration from the eminently sensible technique of the Orenberg lace knitters–who work their shawls in one piece, center and edging simultaneously. The method for turning the corners is different, but the end is the same: when the shawl is finished, it's finished. You have a center completely surrounded by a lacy edge, with nothing else to do but wear it. Skacel wholesales their pattern collection to yarn retailers everywhere, so if you'd like a copy, contact your LYS. If you run (or know of) a shop that's got Giovannina in stock, please feel to speak up in the comments. If you'd like to ask your shop to place an order, the pattern number is 21100405. *My mother has inherited this supernatural ability to see through solid surfaces, as well as the skill to effortlessly stun small children with it. We had that same kind of "frontroom" when I was a kid, but we called it a livingroom. As kids, we were never allowed to go in there except for special occasions. On one of those occasions, the child of a guest puked up red Kool-aid on the WHITE carpet. After that, there was no occasion special enough to allow a kid to enter that room. Who in their right mind has white carpet anyway? Your new shawl is lovely and I will make it someday soon. You're writing had me in fits of laughter and tears. I don't knit, just drool. And my lord is that shawl drool worthy. I may have to connive a knitter friend of mine to make this. Well that or pay them handsomely. My sakes, what a lovely. I had (American) friends with just such frontrooms. In my stillest heart of hearts, in which I am still 9 years old, I have a small corner of jealousy for those who lived with plastic-covered furniture. I always thought frontroom had a "ch" in it, ya know, fronchroom. No? Maybe it's a Chicago thing. First, and foremost, you brought back a memory that had long been lost in the recesses of my mind - the "frontroom." WE called it that too! Thank you for that poignant memory. But its' been soooooo long. (I grew up in California but my mother hailed from Oklahoma and Tennessee stock.) Second, I LOVE the pattern and will search it out. I rarely wear shawls but love to knit them. This one - I'll wear. such excellence! I happen to have a couple of hanks of Filisilk hanging around, and I was wondering what to make out of one of them ... you are beyond a genius, kind sir. Thank you. But what inspiration this wrought! Gorgeous, dignified and simply breathtaking. Being RHCD's friend who likes to knit, lace even, I am feeling a call to duty. I may have to temper the flames by digging into my UFOs now that I know there is a wish list a-brewing. I recall being mystified and drawn to the most formal and plastic-covered of frontrooms which belonged to my friends' families in grade school. I never could learn that those candies were not worth the effort of sneaking them. Oh gosh, how I remember my grandparents' knickknacks. And their "jeweled" christmas tree ornaments (most likely made from Mary Maxim kits). I remember after the kind of carpet was vacuumed, one raked it to obliterate all evidence that a vacuum had been used on it. What a lovely read; it reminds me of certain Italian and Croatian family homes I'vve been in. 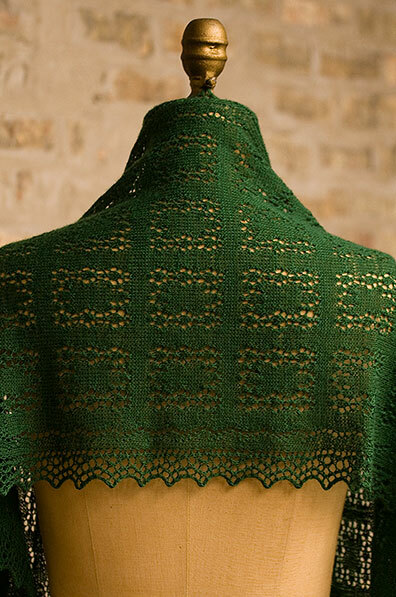 The Giovannina Shawl is gorgeous! The Orenburg tradition is a very logical way of knitting, I agree. Fantastic Job, Sahar is awesome and on my to do list. Skacel has a way of being so giving what a blessing . I congratulate you on your design. My sister was absolutely convinced that mom could see through walls when she was four. That is so beautiful. And what a marvelously told tale of your grandmother and her frontroom. Thank you for introducing us all to your grandmother. Your prose made her real for me. Franklin, you write so beautifully. I felt as though I was in that frontroom. And what a wonderful shawl pattern. I hope I can get a copy of the pattern here in the Netherlands. The shawl is beautiful as is the story about your grandmother. What a beautiful shawl -- I love the design. And I very much enjoyed learning about your grandmother. Our frontroom was called the parlor, but it was decorated very similarly - we had that French provincial console stereo too, and plastic on the furniture that was sat on 3x a year. I am not much of a lace knitter, but you've won me with that one! This essay moved me to tears, it was so visceral. I was in my G&G's frontroom right with you, I swear I could smell it, hear Bing Crosby, and wonder in amazement at all of the treasures. We were only allowed in there on Christmas. I house-sat for them once in college, studying for final exams, and I could spend all the time I wanted in there. The treasures I saw really weren't that amazing. Your lace pattern is beautiful and would have earned a valued place on the back of the ivory "davenport" in their frontroom. I wish I was a lace knitter...someday, and I hope I find that to be an amazing treasure. Beautiful shawl! Beautiful story! Thanks, Franklin! Grandma Jennie's front room! Yes! For what it's worth, the mints were passable (Franklin never liked minty things) but yes, the ribbon candy might as well have been actual glass. And I LOVED that wallpaper. I used to pet it. It was fuzzy! Franklin, the shawl is beautiful. Thank you for creating it. That sounds JUST LIKE my mother-in law's living room. Even as adults we were not allowed to sit in there. After she died, we sat on her sofa, propped our feet on her coffee tables, and ate fried chicken (with our fingers!!) while we all told stories about her life. It was great. Both the story and the shawl are exquisite in design and execution. I'm not usually interested in rectangular shawls, but this one struck me. Maybe, just maybe, I can get the LYS who is listed as a source of things Skacel to order it for me. Oh Franklin! What a beautiful story to tell of the inspiration of such a beautiful stole. I don't know which I enjoy more. Thank you for sharing them both. We had a silver xmas tree just like that one, but our deep shag carpeting was two toned green. Ah, yes, I remember raking the carpet. Beautiful story with a beautiful shawl! Ah, Franklin. We had Frontrooms in Connecticut, too. Although the South End of Hartford was absolutely loaded with Italian/Sicilian immigrants, I never saw the plastic slipcovers because we all lived in apartments and there was no extra room for such a special place. The baby boomer kids took up every square inch of space. When I got older and had friends in the suburbs, then I saw the plastic. I was gobsmacked, overawed, stunned, at those rooms. Your tribute to your grandmother brought a tear or two - starting with your thanks for the birthday checks. Thank you, Franklin, for the gift of this blog. I love this story! I think every family - even a hillbilly escapist one like mine - has some portion of the house that's a haven from the "dirty" world. Visiting my future husband's parent's home was the first time I'd actually sat on creaky, thigh-pinching plastic slipcovers, though. It's an absolutely lovely shawl - I love square and rectangle shapes! Hello, long time lurked here just dropping a line to say that this is a lovely story. Made me laugh and cry at the same time and remember fondly my grandparents. I also absolutely love this new design. Can't wait to get my hands on the pattern. I grew up visiting Italian grandparents who lived in East Boston. Except for the colour differences, you described their living room exactly. I have my mother's Infant of Prague, not sure what happened to my grandmother's. Only my grandmother never learned to speak English, and I never learned her dialect (we learned standard Tuscan Italian at school). The shawl is lovely. I think it's going into the queue. Such a lovely tribute to your grandmother, Franklin! I wish I was that eloquent with words! A little ticked at you for having to go blot mascera now though! BEAUTIFUL post AND shawl! Beautiful story, beautiful shawl. I'll be looking for that pattern. My grandmother did not have plastic on the furniture in the front room, because that furniture was not for sitting on ever -- except on Christmas. The plastic was on the furniture in the den, instead. We used to joke that it was a DNA collector, because when you sat on the couch in summer, and stood up without thinking, you left skin behind on the vinyl! We finally got wise and began putting towels down to sit on. I never could have realized, as a little girl, how much I would miss those damn vinyl slipcovers now. Thank you for bringing the memory back. I will be hunting down this pattern and making it in honor of my own Teutonic grandmother, who I think would have found the delicate structure appealing indeed. Cheers, Franklin. A touching tribute and a lovely shawl. When I saw the picture, I could totally see the connection to your grandmother. It seems a perfect fit, right down to the color. I spotted your gorgeous pattern on Rav & came over here to gush about it. I thoroughly enjoyed the lovely detailed stories of your grandmother. Oh, and I'm working on my ability to see through solid objects & stun my children. It's a good deal of fun. What a lovely shawl and memory. And here I thought that particular approach to interior decorating was unique to the Portuguese! The shawl is definitely going into the queue. Continents apart but oh boy did you bring back some memories! Yes that particular room... under lock and key only to be opened on the "good" occasions. Your project, amazing! I love the forest green color! Gorgeous! How lovely! I've been looking for a shawl to knit my mom, a woman who does not wear shawls, but kind of wants to. This is perfect! I've developed the ability to "see" my kids through walls. Our living-room, however, is very lived-in. Very. The lace shawl is glorious, and I look forward to it. But it's your story that made me laugh and cry. How well I can picture the scatter of pills on the sacred table, the clothes on the floor, and what that meant. Thank you for giving it to us. Must go splash some water on my face and get presentable - am at work. Take good care. One of my grandmothers had the estimable name of Estia Marceil, so naturally, she went by Susie. I so enjoyed reading about your grandmother. I am sure she was so proud of you! Beautiful shawl. The Orenburg construction style is my favorite, too. Thank you for sharing this story. The lace is gorgeous. Your grandmother and my grandmother must have been long lost Italian sisters :) You described her living room to a T, right down to the plastic covered sofa and ribbon candy in the candy dish. In my family the living room was always the "frontroom" and the aluminum tree at Christmas was a given. Thank you for all of the wonderful flash backs to my childhood. By the way, I love the shawl. I am going to order the pattern. My grandma's place was a plainer, Protestant version. No plastic slipcovers, but the grandchildren were all forbidden to enter it carrying any food or beverages. Her candy dish contained spearmint leaves. The pattern is beautiful, and going directly into my queue. Thanks for the story, Franklin. Matilde looks lovely in the new shawl. Your posts always bring me to tears. One of my grandmothers had a 'frontroom' too. And, much too early I had to learn that nothing lasts... What a beautiful tribute you've designed for Giovannina. I hope to make it one day. beautiful shawl and wonderful story; thanks for sharing both with us! My sister and I were just talking about the frontroom and my grandparents' "den" (really just a bedroom with the TV, some recliners, and the couch). My family is Polish, so I wonder if the term is Midwestern or somehow generational. My family called it the frontroom, too, but we lived in it. My Papa was the only one who spent any time in my grandparents' frontroom. The stole is beautiful. And the shots make me miss my most favorite yarn store! Bellissima! Giovannina is just simply beautiful. You succeeded in bringing me back to the first time I met my Italian mother-in-law. I sat on the plastic covered couch, with the gold threaded upholstery underneath that was never touched by human hand, crocheted antimacassars hung on the back and arms. The room was pristine, carved candy dishes with white doves held the hard as rock ribbon candy. A painting of St Theresa watched over us. I was never more nervous in my life. Your work and your words amaze me. How I recall the plastic on our FRONTROOM sofa. THe shawl is really gracious and i'd love to wear it. Someday when I am better at Lace. Thank you Franklin for both your beautiful story and for the pattern that will be added to my queu. I am the daughter of a Polish immigrant who grew up in Chicago but your description of the "frontroom" mirrored that of my mothers. I would have to add a "davenport" and a "Hi-Fi" with sounds of Harry Belafonte or Herb Albert and the Tijuana Brass and you have carried me back 45+ years. It's beautiful, and your grandma sounds wonderful. My grandma -- closer to the age of your great-grandma -- had a similar frontroom, even though she only had one living area. But it was always called the "frontroom." I think I was probably in college before I heard the term "living room." Oh man, I know that frontroom. It wasn't in our house or that of our relatives, but (and this is hard to admit), it was in the houses of people more upscale than we were. That the plastic covers would be removed is indeed a shocking sign of impeding doom. Lovely shawl, and the construction sounds wonderful. Too bad it's not available online. Dayum! That's gorgeous. Unique and gorgeous. Great story and lovely shawl. The tiny house I grew up in had a kitchen, bathroom, 2 bedrooms and a living room that was called the frontroom. It did have a davenport in it. I just love stolling down memory lane. I feel compelled to comment about the supposed lack of natural fiber in the photo of your lovely grandmother. Unless she wore a wig her hair is a natural fiber :) also the shawl is a beautiful tribute to such a wonderful sounding person. Beautiful story to go with a beautiful object. Frankie, ya did your Grandma Jennie proud! The photo seems to agree with your assessment of her not being a fan of wearing shawls or stoles. . .
. . .but I'd bet the rent check she would have turned cartwheels if you had presented her with curtains, a counterpane, or a tablecloth made from the same pattern. You'd be eating her special recipe for (-----) until it came out your ears! First, my grammy was Giovanni, and she also went by Jenny. It seemed the Right Thing to us, too. Second, the shawl is astounding. Just marvelous. Your grandmother would have been very taken with it, and not just because you designed and made it. It's wonderful. Lovely design. Yes, orderly baroque. I think it is in the grandparent job description to teach that all will not always be as it is; lucky to have had the sequel: and you will still be OK.
My German grandparents had a front room. With 12 people living in that bungalow, it was not for Sundays only. A few ashtrays but no knick-knacks; nothing to distract from the art: the Sacred Heart and Our Lady of Perpetual Help. My older boys are about your age, and they were convinced that I could see through walls because I could unfailingly tell them to "stop ________" with exactly what they were doing. It cracked me up when they told me this after they were grown.......oh, the power of mothers and grandmothers. Love the pattern and the yarn. The front room you describe is almost identical to the Irish 'parlour' (the frontroom was the one we used day to day if we weren't all in the kitchen) and the only difference is why keep the knick-nacks to just horizontal surfaces?! I still have vivid, vivid memories of a great aunt who had FOUR of those 'moving' waterfall scenes on the one wall. My grandmother had the plastic run way on the carpet , covering the lamp shades and the couches in the front room! thank you for sharing those memories. I lvoe this pattern. I will be asking my local shop to get the pattern. I don't like geometric lace patterns. No, that's wrong. I never used to like geometric lace patterns. I love this one. Grandma Jennie would be so flattered! I don't know what is more lovely - that you shared these memories with us or the shawl! Thank you! Franklin, I know your grandmother is loving that shawl and is smiling down on you. Being of Greek descent, I understand the concept of the "frontroom." In fact, I have one in my own home - it's our living room and we call it the "no no room." We are about to build a new house, and are not going to put in a living room. We do our living in the den and kitchen...so why have a room we don't use except for Christmas and state visits. Last time I checked, the state visits tally sat at zero. My mother (who is only 69) has a frontroom. It contains brown shag carpet, heavy Victorian furniture (including a pump organ), tapestry curtains from Penney's, a cabinet full of Hummel figurines and my great-grandmother's china, and what I refer to as "the wedding shrine"--a collection of photos and memorabilia from my wedding some 18 years ago. At Christmas, it features the "Molly Brown Christmas tree," completely covered in red and gold ornaments (those Mary Maxim beaded ones) and angels. Beautiful shawl and a lovely story. My family is Portuguese but my grandmother (a Diamantina who went by Tina) had a very similar frontroom. I'm pretty sure I could find a picture in my memory box very similar to the one of your grandmother - the dress, the hair, the wallpaper and the tree were all very familiar. There was no Infant of Prague but there was a Crown of the Holy Ghost and a picture of the Bleeding Heart of Christ hung on the wall. My grandparents liked the protective plastic so much that my grandfather lined the leather seats in the back of Cadillac with it. My grandmother on my other side also went by Jennie but it wasn't her given name. Thanks for bringing back all those memories and thanks for the beautiful pattern. This goes in the its a small world category, I was born and raised in St. Clair Shores (on Gladstone Ave.) we had a living room though and it was used all the time except when we were in the kitchen. My great Aunt had a frontroom that no one was allowed to go into, with the white furniture that was gold trimmed on the gold shag carpet that was raked after vacuuming so the tracks wouldn't show. I'd forgotten most of that, thanks for the trip down memory lane. Well, the shawl is lovely, but the CHRISTMAS TREE in the photo? Yeah. My Italian grandmother in a different Detroit suburb had that tree as well! Did you grandmother also have the crocheted doilies under her table lamps that were starched into high-standing ruffles? Ha ha....I love being Italian! Thanks for sharing! My children are still amazed that I can tell what they are doing even when they are in a different room. I hope I never lose that power. My next door neighbor had a frontroom like your grandma. I was always in awe of its beauty. "Ornate but orderly" is the perfect description. And lovely. I had a great aunt (by marriage) who was legally called Fanny. Not as vulgar here as in the UK, but....she refused to answer to anything but Frances. And I am proud to have her kitchen pans and make apple pies in her memory! Odious little goody goody. 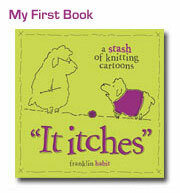 You are too funny and way talented with yarn and words. My grandma had a silver foil Christmas tree, too; also in the "front room". I remember how fancy and "modern" I thought it was as a kid. Such fond memories. My French-Canadian grandmother and your Italian-American grandmother must have been related. I much prefer wraps to triangle shawls so I will search out this pattern. Thanks so very much for such beautiful work. PS: I lived in Sicily until a few years ago and your piece reminded me of an older gentleman there who told me about the requirement for parents to arrange marriages well into the 1970 to ensure that their children marry a suitable Siciliano and keep the family "pure". The attitude still exists in many old Sicilan families. We had a "frontroom" and I HAVE my Grandma's green-and-silver tinsel tree, along with the red tear-drop ornaments (all in the original boxes). Honestly, my own "frontroom" isn't big enough to hold that tree, but I am not getting rid of it! We got to sit on the VERY scratchy black "davenport" which was shot through with silvery nubs. The carpet was a beige sculptured pile, the "sheers" covered each window and the drapes were avocado green. I don't believe I ever remember more than three occasions when the front door was actually OPENED. By the way, I do love the shawl. I'd love to try it; I'll check with my LYS for the pattern. My job was to rake the vaccum marks out of the carpet, thanks for the memory. Your Grandmother would have loved this beautiful shawl. Holy mackerel, Franklin - I had no idea that the Infant of Prague has different colored robes! Frank thank you for sharing the story about Grandma Jennie. She was a special lady. The shawl show the love you felt for her. I know if she was still around she would have love the design as much as I do. Hey- I grew up there. You got the infant of Prague? Does he have a dollar bill taped to the bottom? My California kids look at me blankly when I say frontroom and pop, but I still can't stop saying them. I, too, was crying with laughter: no natural fibers visible - are you including your grandmother's hair? It surely has a laquered outer shell of some sort, anyway. You're so lucky - beautiful Italian and Arab names to choose from. Franklin--where in St. Clair Shores?? I grew up there and my parents still live there (near 11 Mile Rd. & Harper.) BTW...beautiful shawl. What a beautiful shawl! And I love your stories about the women in your family--they're so moving. OMG! My father brought home a tree just like that. My mother let him put it up as long as he still put up the fresh cut one for us. And here I thought we were the only people with an aluminum tree! Lovely, lovely shawl and a beautiful tribute. We had a similar room, but called it the livingroom. Christmas day, Sunday guests, and where my parents went to escape the kids. Kids were NOT allowed in on a daily basis. We didn't keep the plastic on the furniture,though (maybe it was an Irish thing). And my mother had that exact Christmas tree. We loved it! All those shimmery branches! Each on was in it's own cardboard sleeve! Thanks for all the memories. I really started this comment to compliment you in thebeautifulshaql pattern, but memories of my childhood took over! My family is nowhere near Italian or Detroit, just Waspy Yankees, but we have a 'frontroom'. It's not even the front room but in the middle between the kitchen and a bedroom. I guess it's just the timeline of things. Dage Baroque? That's better than my friends and I refering to it as Capodimonte. Not the good 1700's kind, either. I remember the "frontroom" in my great grandmothers home. It was called the Parlor. No One ever went into it. Saved for the weddings, or funeral wakes. Love the shawl - its in my queue! My Nanna was also Giovannina, called Jennie. She's always with me but thanks for bringing her to mind so vividly today. She also had that Christmas tree, with the rotating spotlight that changed the color of the tree to red, green, blue, yellow as it spun. There was an infant of Prague, but the Pieta had a front row seat. And those plastic covers were not just for furniture. Gold-flecked plastic stretched over the seats of their white Cadillac. It had huge wings in the back. That is a beautiful story about your grandmother. I read it while wrapped up in an old quilt made from the overalls my late grandfather always wore, which made the reading even more poignant. His house had an untouchable room like that too, and he left it that way for years after the grandma I never met passed. The shawl is gorgeous. I will have to see if my LYS carries the yarn. 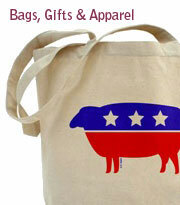 If not, they are wonderful about special orders. 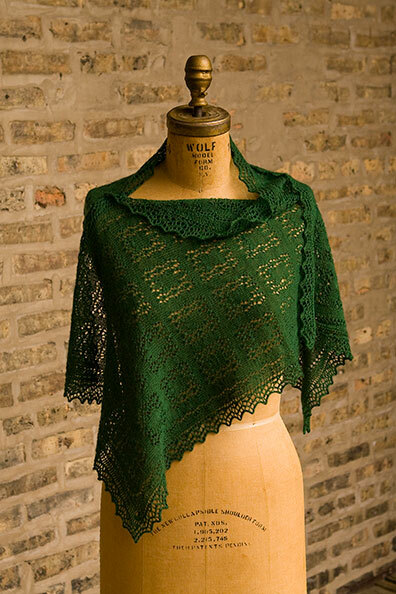 The shawl and lace pattern are truly gorgeous. My mom was born in the early 30s and still lives in St. Clair Shores. Makes me wonder if we both grew up in Detroit and didn't know it. Mom never had an untouchable "frontroom" but my father's mother (born 1897) did. Great memories! Ah, the "living room" where no one was allowed to actually live, but could visit on rare occasions. You described your grandmother to perfection, and the love surely came through. And I smiled at the tree, we had one of those too. And I hated it. No natural fiber in the picture... very funny, but does this mean your grandmother was wearing a wig? I don't want to be disrespectful though. I think you write very lovingly about your grandmother and it's great you dedicated this beautiful pattern to her. The description of her room is unusual. I don't recall I've ever seen anything like it here in the Netherlands, not even in the sixties. Sofa's covered in plastic...never. But very interesting, has it got anything to do with her Italian origin maybe or is it typical American? well, guess what arrived at my LYS today? yup, and guess what else? I have started it in Filisilk - up to 4 repeats and 'tis time for sleep. So I can get up early and continue to get through the next 17. Thank you, Franklin! my jury duty stint next week will be truly more enjoyable because of you and your Grandmother. The shawl is so beautiful, and as usual, I am gobsmacked by your lovely draping and photos of it. I grew up in St. Clair Shores. My parents still live there. We also had the frontroom (pronounced more like fron-troom) and the added-on family room behind the kitchen. Our frontroom was not ornate like your grandparents' but that of my best friend across the street was decorated with plastic covered furniture and lampshades. I don't recall ever actually entering that room, and certainly I never sat in it. They also had the silver (revolving with colored light wheel underneath) Christmas tree. Even though not fancy or expensively decorated, we also spent little time in the frontroom. All of our time was spent in the kitchen and family room. I wonder if your Grandparents lived close to us, or if we ever crossed paths. It's a small world. Beautiful shawl. I am sure your grandmother would have worn it if for nothing else than the respect of such a work of art lovingly created by her grandson. And what a great story. Every mid-European mother I knew falls into the same category - the plastic on the furniture, the room that's too good for anything but the best of company, the ability to know when someone is touching something from a whole story away. For some reason, it just never took in the next generation. Emaneula (Nellie to all, of course) Lombardo, caused quite a stir when she announced her intention to marry not only NOT a Sicilian, but a Frenchman! They also had a Christmas tree exactly like your grandmother's. I love your grandmother. She reminds me of my childhood. And they sure knew how to 'do' polyester in those days, didn't they? Thank you for this post. I especially loved the part where you realized that nothing is forever. One question, though: In the picture of Jennie and the Christmas tree, when you said there were no natural fibres in the picture, did that mean she was wearing a wig? 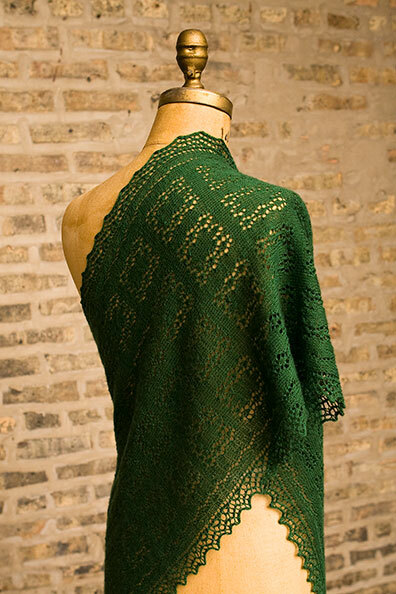 The shawl is lovely, and the back story makes it even moreso. This is lovely, Franklin. I'm waiting to see how you interpret your Auntie Eva. I bet the result will be stunning. Oh so beautiful. The color, the lace; it's a piece of art. Whew! I finally found the pattern @ FiberWild.com. My grandparents were full Sicilian also! I love the plastic on the furniture, did they also have the hard plastic carpet runners with the teeth on the bottom? I remember hot chicago summers with no where to sit that didn't make you sweat! Ha! I loved this entry - it brought back a lot of memories for me. And the shawl is gorgeous too! I was going to take you to task for the "no natural fibers" comment because (a) it made me almost spit hot coffee and (b) I was going to say all that HAIR was a natural fiber but then I remembered how much hairspray it took to make it that way, and what the stuff was like back then, and yeah, it probably wasn't natural but "treated" fiber. Related story: When my cousins and I were bored at my grandmother's house many summers ago, we decided to see if we could make our very long hair stand up on end using her hairspray. We could! And we got in sooooo much trouble for it! It took hours to get out and I also learned an important lesson: Never let your mother scrub your hair when she is mad. And I do love that shawl. I just bought some indie dyed lace weight in a blue that might be destined to become "Giovannina". Great work and a wonderful story. Pandora Beads is now giving a gift with purchase: spend more than $100 on Pandora jewelry and receive a Pandora clasp bracelet (a $65 value) for free, now through Sunday, Sept. 11. The restaurant space, previously occupied by Ixtapa, is undergoing a complete interior renovation and will reopen with a fresh look and feel. Also joining Fox Run Mall will be Pandora, Zumiez and Image Arts Etc. Bl&^dy hell! That is BEAUTIFUL! How do I get my hands on the pattern in the UK. Great post, great shawl. That's drop dead gorgeous! I'm not a shawl wearer either, but I'd make an exception for that. Amazing! I stumbled on to this blog searching for some information about my mothers name, which is also Giovannina. Her mother was from sicily also. I guess that must have been a popular name there. My name is also Giovannina and so was my Great Grandmother named the same.